I’m on my second time around reading of The Zen of Listening. I feel it’s my private workshop and I read it ever so slowly and wince every time you describe one of my distancing techniques. I’m giving a copy to my best friend so we can discuss it. I plan to read it over and over again until I can feel your advice pulsating through my veins! I’m 76, by the way, and have been trying to listen mindfully and lovingly for 40 years! With love and prayers. Aggie M.
Poor listening is the source of many headaches and heartaches in our lives – failed relationships, lost customers, divorce and poor grades – just to name a few. 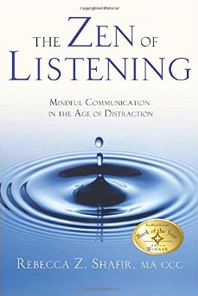 Rebecca Shafir’s award-winning book, The Zen of Listening: Mindful Communication in the Age of Distraction gives readers simple, authentic and reliable ways to connect more efficiently with people and information. The mindful listening method utilizes more brain power, thus improving concentration, memory, focus and the ability to capture more than just the spoken word. Shafir provides readers with a solid foundation for listening needed to deal with today’s communication challenges – difficult people, information overload and reduced attention spans. Join the legions of readers worldwide who have experienced the life-changing experiences that come from mindful listening. The Zen of Listening was first place winner of ForeWord Magazine’s Book of the Year Award in 2000 and has been translated into Spanish, German and Turkish. The ability to listen clearly is what enables us to find our true self and help others. Rebecca Shafir points directly to this fundamental skill, with step-by-step teachings used in the Zen tradition for centuries. Don’t just “read” this remarkable book; use it as a guide and practice its teachings in your everyday life. Clear, well-written, and thoughtful, The Zen of Listening does more than just address the importance of listening; it teaches us how to listen by providing practical direction and useful suggestions. In an age of distraction, bias and rampant disrespect, mindful listening can enhance our personal and professional relationships and return us to full, active, and conscious participation in our own lives. In this wonderful book, Rebecca Shafir teaches us that mindful listening, while demonstrating respect for others, will lead to more satisfaction and fulfillment. It will help us regain control and be present in every moment. It is not just to be read once and put aside. Its lessons should be applied constantly every day – regardless of your profession or personal beliefs. 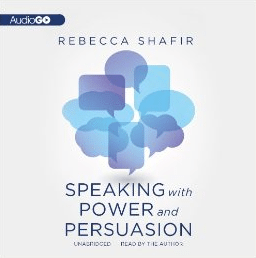 Rebecca Shafir takes us to the heart of relationships and shows us the power of authentic listening – not only to others, but to our own inner self. 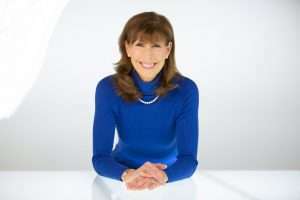 Rebecca Shafir takes her readers by the hand, showing us how to be mindful listeners and inspiring us through the process of calming the mind, opening the heart, and hearing – often for the first time – what our family, friends, and colleagues are saying to us. She teaches us to listen to ourselves as well as to others – to our inner dreams of yearnings and to the wisdom and beauty that are always around us, when we silence the voice in the back of our head and begin to hear. If you haven’t yet read this unique and powerful book, buy it today. It is practical as well as profound; it will change your life. Trainer and consultant; President of the Blakeslee Group, Inc. The Zen of Listening awakens us to the potential for intimacy, compassion, and growth inherent in all of our most important relationships. In The Zen of Listening, Rebecca Shafir explores how traditional mindfulness practices can help us to communicate with more clarity, depth, and meaning. Ultimately, we discover that mindful communication is a doorway to our own selves, and that our communication is enhanced when we become closer to our own basic nature. When we bring our full awareness and an open heart to our lives, we cannot help but communicate more genuinely. If this message were heard and practiced more widely, it would not just change our communication; it would change our culture and our way of life in critically important ways. People’s true thoughts and emotions are found in the subtleties of their communication, and Rebecca helps us hear these whispers. Well done! Chief Executive Officer of Intuition, Inc.
By listening we drink in our world. To the extent that this innate ability is compromised, however, we become more or less alone, adrift in a sea of distraction and splintered attention, unable to know ourselves or others in our local or cosmic contexts. Rebecca Shafir has written a book about listening that makes clear what is at stake as our world becomes ever more cluttered. And most importantly, she shows us how to open to a quality of listening that enhances our lives and the lives of those we touch with an open and caring presence. It’s hard to imagine a greater contribution than that. Written by a master of communication as well as a kind and sensitive human being, this innovative, original book will help all who read it, from business people to families and couples, from teachers who want to improve their work to spiritual leaders who seek to find the meaning in silence. It is a superb book – timely, practical, and profound! Truly listen and the world will reveal itself in all its splendor. The Zen of Listening will inspire and guide you to listen in a centered and mindful way. It is one of the greatest gifts we can give others and ourselves. From my personal experience as a parent and physician, I know how vital listening is. This book helps people find their solutions and way through life. Zen of Listening – Audio Version! Mindless listening or no listening at all, in large part, is responsible for the national tragedies that surround us: the high rate of divorce, intolerance, schoolyard and workplace violence and substance abuse. From an economic perspective, poor listening is responsible for billions of dollars of lost revenue due to inefficient teamwork, high turnover, and customer dissatisfaction. And, if the overloaded health care system hasn’t done enough to weaken the physician-patient relationship, add a poor bedside manner to the mix and you have a costly prescription for malpractice. Why has our ability to listen deeply gone by the wayside? Chronic interruptions and distractions abound, texting, social media, Internet addictions, and our hyperactive schedules have fragmented our attention spans to new lows. It’s possible that with a little change every day you can control distractions and connect better with the important people in your life. Mindful listening is a most powerful way to connect with people and information. Its influence can be viral, health-promoting and life-changing. And best of all, just by making a few tweaks in the way you listen to another person you can turn around a sour relationship, negotiate more effectively and build cooperation. Mindful listening is good for your health and the health of those we listen to. Mindful Listening practice is also a great workout for your brain. Learn ways to process and retain spoken information more efficiently. We all love the convenience of a short, precise text message, but it comes at a cost. More and more people are ill equipped to pick up a phone or arrange an in-person meeting, and often even the idea of speaking causes actual anxiety. In Speaking with Power and Persuasion, I give you the tools to engage in meaningful communication with easy to learn steps. ways for a native speaker to help a nonnative speaker improve their English pronunciation. Unlike most advice on improving your speaking that you might receive from a sales trainer or debate coach, Speaking with Power and Persuasion comes from a professional with a solid scientific understanding of the workings of the voice. The techniques I teach are precise, practical, and sustainable. You learn what to do, how often to practice, and exactly why the exercises improve the impression you make on others.